CLEVELAND - Ohio's governor on Thursday signed into law a limit on the collective bargaining rights of 350,000 public workers, defying Democrats and other opponents of the measure who have promised to push for repeal. Gov. 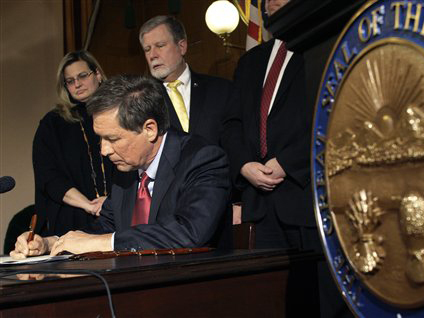 John Kasich's signature came a day after the measure was approved by the state House and Senate, which are led by his fellow Republicans. Opponents have vowed to put the issue on the November ballot, giving voters a chance to strike down the law. Unions plan to hit the streets and help gather signatures. The measure prompted weeks of pro-labor protests by thousands of people amid a U.S. debate over union rights. Contentious debates over restricting collective bargaining have exploded in statehouses across the U.S., most notably in Wisconsin, where the governor signed into law this month a bill eliminating most of state workers' collective bargaining rights and cutting their pay. On Thursday, a judge halted the Wisconsin law, at least temporarily, from taking effect. Wisconsin's Republicans pushed through passage of the law last month despite three weeks of massive protests that topped 70,000 people at the state Capitol and a boycott by Democratic state senators. Opponents immediately filed a series of lawsuits that resulted in further chaos that might not end until Wisconsin's Supreme Court weighs in. The anti-union bills have become a key test for Republicans who made huge gains in November elections by promising to slash government spending at the national and state level. Conservatives argue that such measures are needed to balance budgets and pare down deficits. But opponents say it's union-busting. The Ohio bill drew thousands of demonstrators, prompted a visit from civil rights leader Rev. Jesse Jackson and packed hearing rooms in the weeks before the Senate passed an earlier version of the measure. The Ohio bill prevents unions from negotiating wages but not health care, sick time or pension benefits. It also eliminates automatic pay increases and bans strikes. It applies to teachers, nurses and many other government workers, including police and firefighters, who were exempt in the Wisconsin measure. Kasich has said his $55.5 billion, two-year state budget counts on unspecified savings from lifting union protections to fill an $8 billion hole. He defended the new law Thursday night. "This bill ... does not cut anybody's salary ... does not take away anybody's pension ... does not destroy anybody's health care," Kasich said. "And anybody who's been out there saying that is just factually wrong." The bill signing comes two days after a House labor committee added Republican-backed revisions that make it more difficult for unions to collect membership fees. Under the Ohio plan, police and firefighters won't be able to bargain with cities over the number of people required to be on duty. That means they can't negotiate the number of staff in fire trucks or police cars, for instance. Supporters of the bargaining limits say decisions on how to equip police and fire departments should be in the hands of city officials, not union members. One of the biggest worries is one-man patrol cars, said Steve Loomis, president of Cleveland's local police union. Under the current contract, Cleveland police officers are required to have at least two officers in a patrol car when driving through certain neighborhoods, Loomis said. As Cleveland's population has declined in the past decade, so have its ranks of police officers. Two rounds of layoffs have left the police force more than 300 officers smaller since 2004. The street crimes unit, which used to investigate prostitution and gambling, is no more. The auto theft unit was also disbanded. And a city that stretches 22 miles along Lake Erie no longer has a single police boat to patrol its own waters; that job is now left to the Coast Guard, Loomis said. State lawmakers did make last-minute changes to the measure that allow police and fire officials to bargain for vests, shields and other safety gear. Mike Norman, secretary for Cleveland's local firefighters union, said that's a cold comfort compared with what he called an "all-out assault" on the union.